Chapter 5 is CREATE A SAFE ENVIRONMENT. Today’s episode is brought to you by THE PEER ADVANTAGE, peer advisory groups by Bula Network. The Peer Advantage is a group of just 7 SMB owners from around the United States coming together regularly by way of an online video conferencing platform. It’s convenient, easy and cost effective. Email me at RandyCantrell [at] BulaNetwork [dot] com if you’d like to learn more. The chapter begins with the story of two sons who have agreed to a 10 year buyout of the family business from their father. They pay off the debt in 5 years, but dad is still hanging around, drawing a salary, pitting one brother against the other and dragging things out because he’s not ready to let go despite the agreement. The tension between them all is negatively impacting the family and the business. Who can these sons talk with? Where can they go to have a safe, private and confidential conversation about it? They need to handle this problem or their business and family may implode. But the level of trust involved for the kind of dialogue they need to have requires an environment where each participant can be totally vulnerable yet completely safe. Environments that afford complete safety are rare – nonexistent for many of us. For these brothers, the safe environment of their peer advisory group offered them the support and encouragement they needed to help them confront their father. When they did, their dad got angry, but a week later he realized they were completely right. He was simply afraid to let go. He stepped away from the business, easing the family tension and giving the sons the freedom to nearly triple sales over the next 24 months. Vulnerability equaled weakness in caveman days, which resulted in death. So for many people, being vulnerable isn’t a good thing. Brene Brown, author of the book Daring Greatly, talks about the myth of vulnerability. One myth is that vulnerability is weakness. During her research, Brown asked subjects to finish the sentence: “Vulnerability is ___________.” Sample responses included starting a business, having faith and admitting to being afraid of something. Brown says vulnerability sounds like the truth and feels like courage. It’s about being courageous and telling the truth. Sadly, too many people regard sharing a messy problem, not knowing the answer to a question, or demonstrating a lack of competence in a particular discipline as a sign of weakness, and fear they’ll be judged or ridiculed. Member of a peer advisory group have to learn and understand they can be vulnerable without dying or being judged. Beyond overcoming our fear of being judged, there’s another challenge to creating a safe environment. There are very few safe places in our society for true vulnerability. We live in a world of constant, almost instant judgment. It’s especially true for CEOs and business owners. Letting your guard down is tough because it requires you to consider that this new environment – the peer advisory group setting – is different from anything you’ve ever experienced before. You may believe when you join such a group that the members are asking you to trust first, then you’ll get trust in return. The good news is the opposite is true. It’s likely during the first meeting that somebody will share a personal story and you’ll quickly realize it’s the first time that member has ever told it out loud. The group is ahead of you. The water is fine. After building trust, people can have faith in the sincerity and depth of other members’ caring. That’s what allows members to effective challenge each other to grow. If you’re a judger instead of a learner, it’s unlikely you’ll feel comfortable in such a group. Learners are ideally suited to benefit from participating in a peer advisory group. All members of the group comply with the group’s norms. There’s a consensus that confidentiality is critical and key. A dedicated onboarding is essential for exercising your vulnerability muscles. The authors interviewed dozens of peer advisory group leaders to discover the shared best practices for onboarding. The first and most important step is to engage the members as equal. New members feel welcomed as equal partners and now understand they’re part of a group that values them and cares about their personal and professional growth. Additionally, the new member gets a written profile on each of the other members before the first meeting. These profiles tend to offer more details about the group members than what may have been shared with the new member before joining. Every member will take a few minutes during the first meeting to talk about who they are, how long they’ve been in the group, and the biggest value they’re getting from the group. Group members are also encouraged to reach out to new members outside of the group meeting. Members are often asked to share stories about their lives and identify any weaknesses they may have. The objective is to inspire questions and invite dialogue. That creates open conversation where members can feel free to share anything they’d like. Jim Kouzes, author of The Leadership Challenge, says if you want to build trust, everybody needs to feel the same level of vulnerability. One way to accomplish that is through self-disclosure. When members share who they are, where they came from – and go back as far into their childhoods as they’d like – the group learns about who they are as people, and it fosters others to share more about themselves, too. By divulging high points and low points members learn that they’re not so different from one another. It creates more trust. Scot Dietz is “head cheese” (his real title) at 3 Blind Mice Window Covering in San Diego was experiencing gang buster sales. In 2006 he was recognized as the second-fastest growing business in the region by the San Diego Business Journal. That’s when he joined a peer advisory group because despite his success, he believed joining a group would expose him to people who could help him get his business to whole new level. When the recession hit, it impacted Scot’s business hard. He suffered 34% decreases in sales, followed by more decreases. His company was sinking going from a $5.5 million company to a $1.2 million company in the span of just 3 years. He admitted to his group that he was drowning. He asked his group members if he should file for bankruptcy. The group went further than that. One of the members invited Scot to operate out of a space he and his wife had available – free of charge for six months. They offered to charge him $500 monthly for the 6 months after that, then to raise the rent to market rates following that. Scot went from paying $8000 a month in rent to zero. That allowed him to get his business on track. Today his business is stronger than ever. The group was there for him as he worked his way back. The group’s value to Scot is priceless. Scot’s problems caused him to open up, not shut down. That made the difference in getting the help he needed from his group. Issues don’t have sides, they have dimensions that go beyond facts. When members open up there’s greater clarity about the issue. And the group can get to the root of the problem. Members make mistakes. That’s why the group and its leader try to avoid missteps. An example of a misstep is a member being disrespectful in response to comments from another member. That can cause the disrespected member to shut down and not share in the future. But it can also serve to put other members on guard. If the misstep isn’t addressed immediately, the group dynamic can be forever damaged. Repeated acts of such disrespect to others would necessitate dismissal of that member from the group. No single member is more important than the group. The authors research revealed that such dismissals are rare. Member of peer advisory groups tend to understand and comply with group culture and norms. Besides, a single misstep doesn’t necessarily spoil the group, as evidenced by a story Jim Kouzes told about his colleague and co-author Barry Posner. Barry was leading a workshop where he was getting people to do the “trust fall” exercise. In 30 years of doing that they had never seen anybody get hurt. People tend to do what they’re supposed to. One day a participant asked Barry, “Professor Posner, why don’t you do the trust fall?” He’d done it many times before so he told them instead of falling over he would lie on the ground underneath and take a picture of everybody catching each person as they fell. He warned the catchers that if they failed the person would fall right on top of him. Everybody agreed it was a great idea. So Barry got down on the ground, aimed his camera up at the person standing on the stepladder about 3 or 4 feet off the ground. The participant fell over backward, but for some reason the catcher didn’t catch. The person landed right on Barry. The faller wasn’t hurt but Barry lost his breath momentarily. 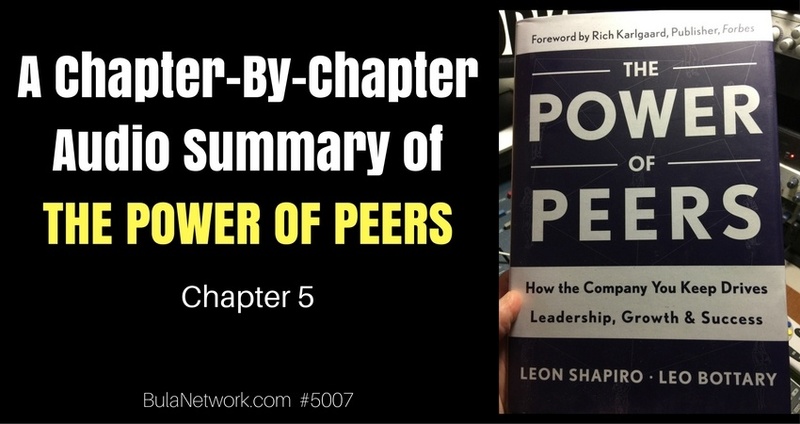 Chapter 6 will cover the third of the five factors – the role of the group leader and why an effective leader is the lynchpin of peer advantage. That chapter is entitled, Utilize A Smart Guide.